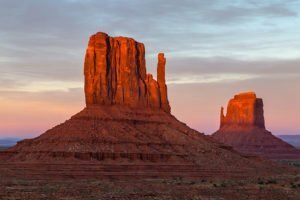 There are many fascinating places in the Four Corners region, from Monument Valley to Zion to Canyon de Chelly, to name just a few, but most will agree that the geologic wonder of Grand Canyon is the centerpiece. To me, its the heart of the Southwest. Grand Canyon can open our eyes, ears, and soul to a deeper understanding of sacred places. Floating the mighty Colorado River has taken me into Grand Canyon’s timeless flow of gravity, moments of rushing over roaring rapids, then coasting into colorful reflections of the cliffs on slow moving water. Hiking into the Canyon has taken me into the depths with a deep sense of harmony. Shouldering my backpack I hike down into eons of the Earth’s story. My heart and breath increase their cadence, my steps dictating the rhythm. My eyes walk over the mesas and temples. My mind collects and organizes the visual drama. Some stories are held in personal journals. Others still wait to find their narrative. Whether route-finding from the South Rim down to Elves Chasm, climbing Shiva Temple, or entering the cliff cave at the source of Thunder River, my camera has witnessed amazing beauty. A weeklong hike from the North Rim took me to Deer Creek Narrows on one of those adventures. Backpacking in the Canyon I got to know a way of life lost to convenience and enriched in experience. I absorbed the emotional resonance of solitude, felt reverence, and sensed deep wonder. I slept listening to the river. The next morning we hiked along the river’s edge from our camp at Tapeats Creek. The route down river was obscure, the ground radiated the midday heat. Then, like a jewel in the desert, water could be seen cascading from a mossy cavern high in a tangerine-colored cliff into a 100-foot waterfall. Deer Creek plunges into a pool not far from the river’s edge. And above the falls, hidden from sight, is Deer Creek Narrows. We hiked up the steep and rocky trail to the level of the falls where the trail then traverses a long and narrow shelf. When the shady trail reaches a broad terrace called The Patio, sunlight pours in. From here Deer Creek Narrows begins, a tight, slot canyon that goes down into the Earth until it ends above the waterfall. 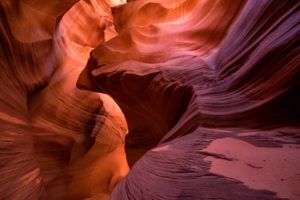 Nowhere else in the Canyon does the sensual play of light and sound create such a sanctuary of natural beauty. From inside the slot canyon sunlight bounces off the pale sandstone casting a subtle glow throughout the intimate space. The stillness of the smooth canyon walls cradles a continuous flow of clear-running, spring-fed water. The creek gently drops and pours, finding its way over and around boulders and small cobbles. Magical light floats with the water’s burbling echoes. Truly an enchanting place. I always thought I would return again. The space between the North Rim and South Rim, those primordial walls of ancient stone, holds a presence of abstraction. It puzzles us, scares us, excites us, and can make us crave to go places beyond human capability. A daring raven sails over the edge of Grand Canyon spreading its wings, catching the wind, leaving the bounds of gravity. What that raven will find beyond the open void is a landscape of mystery and inspiration, a place where we can feel life at its most essential core. A different reality now exists in Grand Canyon. Places change, relationships mature, and at times circumstances beyond our control alter our destiny. 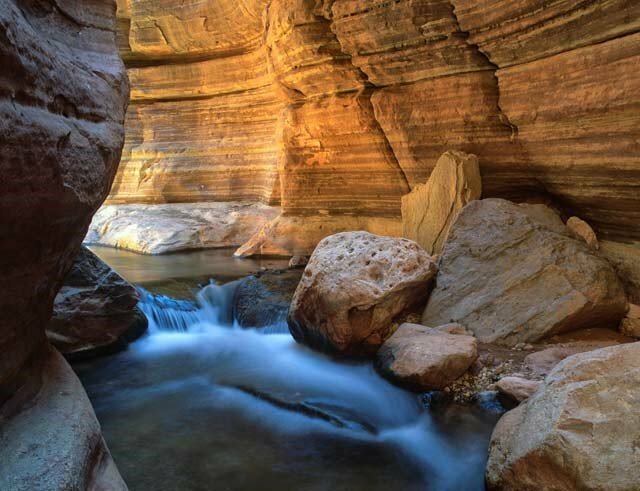 Deep within Grand Canyon, Deer Creek Narrows is now indefinitely closed to visitation. This very special place has been withdrawn from us. 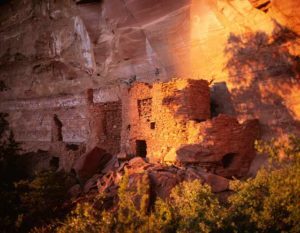 The national park service closed Deer Creek Narrows in 2012 in response to the regional Native Americans request to preserve its sacredness. Speaking about the Grand Canyon, Theodore Roosevelt once said, “Leave it as it is. 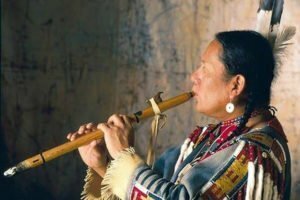 The ages have been at work on it and man can only mar it.” We are experiencing a cultural shift in awareness, frustrating as it is, its a lesson in conscious empathy, an unusual opportunity to restore sacred values to a sacred place. You may be interested in a beautiful new book with over a hundred photos of Grand Canyon. 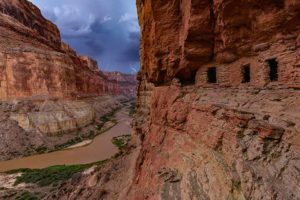 Its published by the Grand Canyon Association whose mission as a park partner is to support publications about the canyon, and fund interpretive talks, research, and scientific papers. The book has a few of my photos including one of Deer Creek Narrows before its closure. Grand Reflections, full-color photos, 9 ½” x 6 ½”, 126 pages, hardcover with dust jacket.